All tracks have been remixed from the original Recycle Or Die versions (no remix titles mentioned on the 4-panel digipack cover). "Leading the charge to turn on, tune in, and chill-out, Europe's top ambient label Recycle or Die has struck a deep chord among a young generartion of music fans with their unique brand of electronic and mind music. Renowned as more than simply a record label, Recycle or Die has become a battle cry for a new consciousness alive in it's sweeping space age pulse - the sound track of choice for the next millenium. 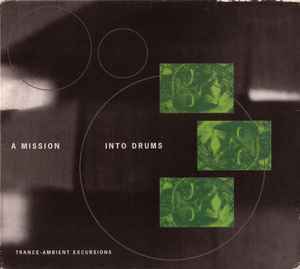 Mission Into Drums compiles remixed versions of Recycle or Die masterpieces opening the door to a tranced-out world of boundless musical possibilities - a thoughtful alternative to the hard-driving dance revolution and a taste of things to come." Art & design for BRD Design.